This entry was posted in Art Challenge, Illustration, Painting. Bookmark the permalink. The original is of course excellent… but this is on a different level. 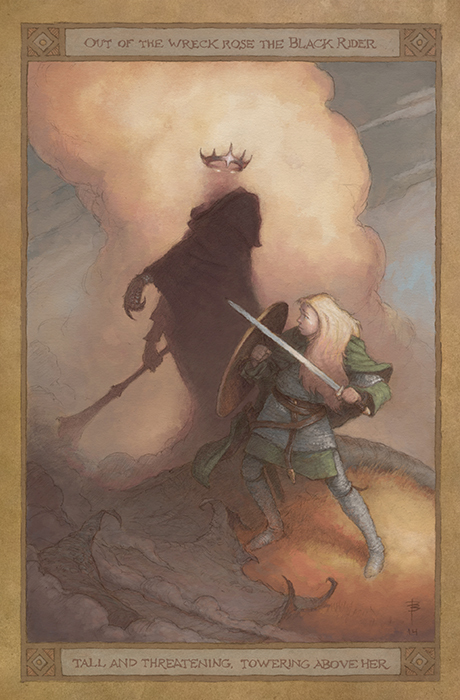 There is so much more flow in the new piece: from Eowyn’s stance, through her waving cloak, and even the increased curve of the smoke cloud. The two figures seem more engaged with each other as well, with Eowyn holding her shield at a more defensive angle, and the Witch King gazing down with a more commanding presence. Eowyn has more expression, too. And the details in her garb and the fell-beast’s remains give the viewer a bit more to chew on. clearly hearkens back to the days of classic illustration, with a perfect blend of innocence and grit. This would not be out of place next to a Rackham or a Dulac. Thanks, Nick – it’s very interesting to hear someone else’s thoughts on this when I’ve spent so much time with it only in my own head. I actually didn’t change the Witch King much at all – the change in how he comes across is all down to adjusting Èowyn’s pose and interaction with him, which is a big lesson for me. I spent a *long* time working on the values throughout the image. I know what you mean about the flecks of magenta in the sky on the original. It was a result how I how I used to work on the iPad back then (in Brushes app), and although I quite liked the effect, it was totally accidental and not controllable at all. Sometimes I get hung up on serendipitous effects like that, and then get sort of hamstrung by them – from not wanting to change them. I decided with this version that everything would be a result of intention, and then I would assess how that worked out! Thanks also for the Rackham comment – I had several artists firmly in mind when I did this, and he was one of them (also: Hiroshi Yoshida, Rebecca Guay, Justin Gerard, Jean Giraud and Tolkien’s illustrations). My tendency to add text is definitely coming from looking at so much of Rackham’s work.